THE PICKIEST EATER IN THE WORLD: LAST CALL FOR SUPER BOWL OF CHINA'S UNLI YANG CHOW 7! LAST CALL FOR SUPER BOWL OF CHINA'S UNLI YANG CHOW 7! Once again, the Chinese food bug bit me badly, leaving me craving for some of my favorite dishes, such as Sweet and Sour Pork, and Lemon Chicken. One of my go-to places for my Chinese food fix, is the ever dependable Super Bowl of China. Boy, was I in luck because not only was I in for a delicious meal of some of my favorite Chinese entrees, but I dined at Super Bowl of China at just the right time... In time for their Unlimited Yang Chow promo! Yes, the unlimited Yang Chow Promo is real. It happens every Monday to Friday, at 11am to 2pm, and 6pm to 8pm, and apparently it has been going on from January, and is ending this March 30, 2018! 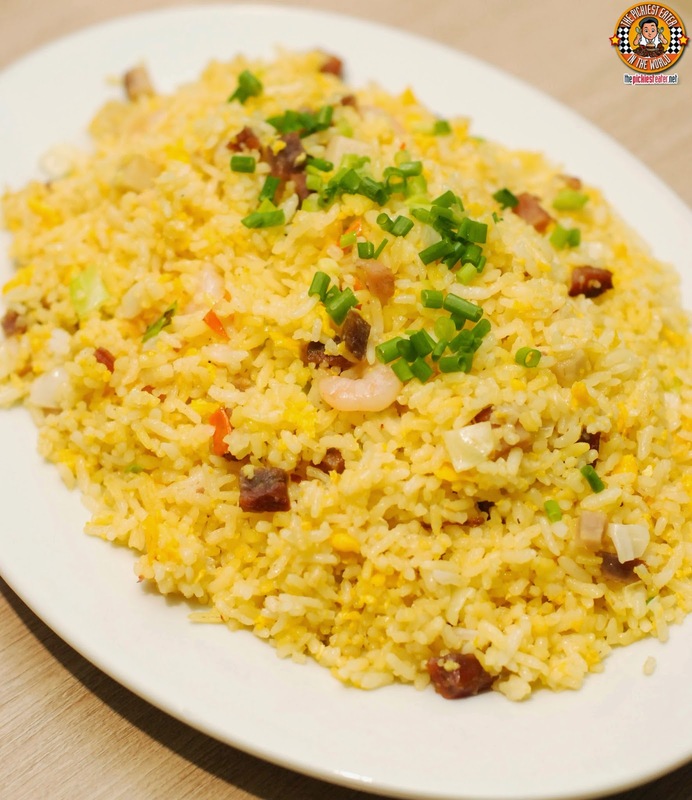 Get an unlimited order of Yang Chow for only P70 per person!! So, you still have a couple of weeks to avail of this awesome deal! When we began, I immediately asked for Four bowls of Yang Chow for myself, but you can only order one at a time. Good thing I was with four other people hehe.. If you've been to Super Bowl of China, or read my post about it from a couple of years ago, then you know that this is some of the good stuff. They're not stingy with meat and shrimps, and the rice is seasoned nicely, making it a perfect compliment to your entrees. Here are some of the dishes that we paired with our unlimited bowls of Yang Chow Fried Rice..
Save for the Pork Asado Siopao, everything in the Dimsum Combination platter (P350) worked well with the Yang Chow. The Pork Siomai, Deep Fried Wantons, Hakao, and Vegetable Spring Rolls were a great way to start your dimsum fix. Super Bowl's version of Rina's favorite Steamed Pork Ribs with Tausi (P130) was amazing, especially when you pour the sauce over the Yang Chow Fried Rice. I also loved the nice chunks of fat on the pork, and the jolt of heat brought about by the Chili. The Asado and Egg Rolls (P120) was also a nice discovery. Shredded Pork Asado is rolled into a wrapped with Egg, a medley of Mushrooms and Vegetables, then deep fried to perfection. It was actually very tasty and enjoyable! The Super Bowl Birthday Noodles (P330) is a celebratory staple for those in the know at Super Bowl. E-Fu Canton noodles are Stir Fried with fresh Shrimp, Cuttlefish, Quail Eggs, Slices of Roasted Pork Asado, and a menagerie of vegetables. The Fish Fillet with Tausi (P275) is always a safe bet. Breaded Fish Fillet Strips are sauteed in Bell Peppers, Ginger, Garlic, and Onions, then coated in a black bean sauce. Amazing. I am pleased to say that the Sweet And Sour (P310) passed my standards. It was beautifully boneless, had a nice crunch in it exterior, and the sauce had a vibrant zing to it, without being to overwhelming, and paired perfectly with the Yang Chow Fried Rice. The Beef with Black Pepper Sauce (P320) was also a revelation. The slices of beef were incredibly tender, and the thick sauce it was bathed in had a robust peppery zestyness to it, that brought out the natural flavor of the meat. You can't dine at Super Bowl without trying the Super Bowl Lemon Chicken (P270). This is probably the dish that helped put Super Bowl of China on the map. The crunchy Boneless Chicken Fillet maintained a mouth-watering juiciness, with a drizzling of a lightly sweet, lemony sauce that melds seamlessly with the chicken. Throughout the meal, the bowls of Yang Chow kept flowing, leaving me incredibly satisfied and.. unfortunately a few pounds heavier than I was a couple of hours earlier. Super Bowl of China's Yang Chow 7 promo ends at March 30, 2018, so I strongly suggest you find the nearest branch near you and avail of this promo immediately! Like Super Bowl Of China on Facebook!